Palate: Medium bodied. Cantaloupe, white pepper, white peach, touch of pineapple mint. Finish: Slightly bitter tempered with tropical fruit. Parting words: For me, the sweet spot for American Gewurz is 2-3 years, right where this one is. To me, this bottle drinks like a crisper, lighter version of an Alsatian Gewurz. That’s not better or worse, it’s just a matter of style. What they share is a commitment to bringing the spicy aspects of the grape to the fore. This wine is not afraid to embrace its Gewurz-ness. I like that approach and I love this wine. This is another big winner from Black Star Farms and another testament to the character and overall excellence of the 2012 vintage. Pairs well with the usual suspects. Arcturos 2012 Gewurztraminer is highly recommended. Appearance: Light gold with not much in the way of legs, but that may be down to the glass. Nose: White peach, Bosc pear, a pinch of curry powder and white pepper, woodruff and fresh thyme. Palate: Medium bodied and medium dry. Spice moving to white grapefruit and unripe mulberry. Finish: Fairly dry with some bitterness on the tail end. Lingers for a good long while. Parting words: The Manigold vineyard is known for producing excellent Gewürz (Peninsula Cellars has also made Gewürz from this vineyard) and this is a very good example from a very good vintage. The back label has a puzzling apology for “obnoxiously loud” LFC Gewürz of the past and hails their return to Manigold vineyards, albeit a different slope. The whole thing is curious but it is nice to have such detail right on the back of the bottle. Also included is the name of the growers, a description of the plot the grapes came from, harvest date and sugar levels at harvest and residual sugar. This wine certainly isn’t obnoxious. The nose is rich with fruit, spice and herbs and enough sweetness and acidity to keep it all in balance. Like most Gewürz it goes very well with food, especially roast chicken and even Asian cuisine. The price is good for a single vineyard wine from OMP. 2011 Left Foot Charley Gewürztraminer earns a recommendation. Notes: Estate grown. Wine was tasted two days after opening. Nose: Crisp semi-tart apples, ripe apricot. On the palate: Medium-bodied and dry. Oak, breadfruit, curry powder, peach, melon. Finish: Fairly dry without much fruit. Lasts a good length of time. Parting words: Shady Lane Gewürz is very well done. It has the spice and dryness one expects from a Gewürztraminer, with the crisp fruit typical of Michigan whites. Even at three years old, and being open for two days (with a stopper in the fridge of course) it wasn’t flabby or tired. Went very well with herb-roasted chicken according to the wife. This was my first Shady Lane wine and I am sure it won’t be my last. Shady Lane Cellars Gewürztraminer 2009 is recommended. Appearance: Light gold. Thick, sticky robe. On the palate: Medium-bodied & fairly dry. Lemon thyme, Meyer lemon, white pepper. Finish: slightly citric & vegetal. fades fairly quickly. Parting words: Umbrella Gewurztraminer-Riesling is a relative newcomer to the Pelee Island stable, but it’s a very good one. Both these grapes do very well in NE wine belt stretching from Michigan’s west coast through southern Ontario into upstate New York. The mix of grapes may bring Alsace to mind, but this wine is all North American on the palate and in the nose. Crisp peach and citrus notes make this a very refreshing drink when chilled, but one with enough interest to appeal to serious wine lovers, at least ones that aren’t put off by the very concept of Canadian wine. If they are, that’s more for you! Umbrella Gewurztraminer-Riesling is recommended. Nose: Woodruff, thyme, paper white narcissus, tangerine. One the palate: Thick and lightly sweet. Bartlett pears, tarragon, lavender, woodruff. Finish: Thick, sweet, herbal and floral. A voluptuous sweetness tempered by a light bitterness that clings to the roof of the mouth and the cheeks for the whole afternoon. Note that only the names of French places are capitalized. Do with that what you will. At any rate, this is a thick, luscious, one might even say unctuous, wine that does pair well with spicy food or just on its own. 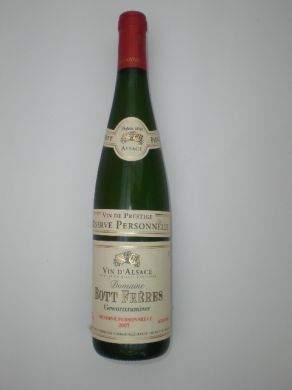 Bott Frères Gewürz is recommended.